It was observed above, that as action and re-action are equal, the effect is the same, whether the sonorous body strikes air, or the air strikes the sonorous body. In the case of a musical pipe this is plain enough: but it was not so well known, nor could it be so familiarly proved, till of late years, that the air can begin of itself to produce the effect, and fetch music out of a string, as a string fetches music out of the air. "Of the strings stirred with the warbling wind." The author of the Principles and Power of Harmony ascribes the invention of what we now call the Eolian harp to father Kircher; and it may be found in his Phonurgia, p.148. In Mersennus, who endeavoured to pick up everything the world could afford him, I see nothing of it. To the best of my knowledge, it was not taken from either of these authors, when it was revived of late years in England. When Mr. Pope was translating Homer, he had frequent occasion to consult the Greek commentary of Eustathius; where he met with a passage, in which it was suggested, that the blowing of the wind against musical strings would produce harmonious sounds. This was communicated to Mr. Oswald, a master of the violoncello from North Britain, and an ingenious composer in the Scotch style, who himself gave me the following account many years ago, when I was under him as a practitioner in music. When he had received the hint of Mr. Pope's discovery in Eustathius, he determined to try whether he could reduce it to practice. Accordingly he took an old lute, and having put strings upon it, he exposed it to the wind in every manner he could think of; but all without effect. When he was about to give the matter up as a mystery or a fable, he received some encouragement to a farther trial from an accident which happened to an harper on the Thames; who having his instrument with him in a house-boat, perceived that a favourable stroke of the wind brought some momentary sounds from the strings, as if he had been suddenly touched after that manner, which, from the genius of theis instrument, is called arpeggio. The man was alarmed with the accident, and made many trials to procure a repetition of the same sounds from a like turn of the wind, but could never succeed: the music was vanished like an apparition. Upon this ground, however, Mr. Oswald persevered; and it came at last in his mind, that perhaps the strings ought to be exposed to a more confined current of air. With this view he drew up the sash of his chamber-window, so as to let in a shallow stream of air, and exposed his lute to it. In the middle of the night the wind rose and the instrument sounded; which being heard by the artist, he sprang out of bed to examine all the circumstances of its situation, and noted down every thing with the most scrupulous precision; after which, as the principle was now ascertained, he never failed of the effect. The construction of an Eolian harp is very simple. Nothing more is necessary than a long and narrow box of deal, with a thin belly, and eight or ten strings of catgut lightly stretched over two bridges placed near the extremities, and all tuned in unison. When it plays, the unison is plainly heard as the lowest tone, and the combinations of concords, though consisting chiefly of the harmonic notes, are by no means confined to them, but change, as the wind is more or less intense, with a variety and sweetness which is past description. I know not how to account for the compass of its notes on the principles of the harmonics, but by admitting a new species of sounds, which I call harmonics of the harmonics, or secondary harmonics. The sharp seventh is very commonly heard, which if deduced as an harmonic, must be of the second species, as the 17th of the 12th; as also the 9th, which is frequently heard, may be taken for the 12th of the 12th: and thus perhaps we may account for all varieties. If we consider the quality of its harmony, it very much resembles that of a chorus of voices at a distance, with all the expressions of the forte, the piano, and the swell. In a word, its harmony is more like to what we might imagine the aerial sounds of magic and enchantment to be, than to artificial music. We may call it, without a metaphor, the music of inspiration. With respect to the peculiar nature and causes of this phenomenon, I dare not promise entire satisfaction from my own speculations, being well aware of the difficulty. The principles I shall offer for solving this wonderful effect are founded on the analogy between light and air. 1. And first I lay it down, that music is in air as colours are in the light. When any body inflects the rays of light or refracts them, it does not give the colours that are seen, but it makes the light give them: so a sonorous body does not give musical sounds, but makes the air give them. 2. That as colours are produced by inflections and refractions of the rays of light; so musical sounds are produced by similar refractions of the air. There is no reason to suppose that air is homogeneous in its parts, any more than light: and if air consists of heterogeneous parts, they will be differently refrangible according to their magnitudes, and excite different sounds, as they are accommodated to different vibrations and capable of different velocities; as the parts of light which are differently refrangible give different colours. The parts of air most refrangible will excite the most acute sounds; and the smallest parts will be most refrangible. 3. That as light shews no particular colour but by means of some other intervening body to separate and modify its rays; so the air yields no particular musical tone without the assistance of some sonorous body to separate its parts and put them into a vibratory motion. 4. That as light is refracted into colours, not only on dioptric principles, by passing through a prism of glass or some other refracting medium, but also by passing near the edge of some solid body which inflects it out of its course; so is the air subject to be refracted by a similar inflexion It would require much time and observation, more than I have had leisure to bestow, to expand this principle into a theory, and confirm it by proper experiments: but the fact seems clear, that sound is produced, and that air becomes vocal, on this principle of a refraction. As the Eolian harp plays by an inflexion of a current of air over the edge of an aperture, so the column of air in an organ-pipe becomes vocal by means of a shallow current which strikes against the edge of the aperture, and is thence inflected into the cavity of the pipe. In the German flute also, the breath gives the tone by passing over the edge of the aperture; and according to its intensity, it produces higher or lower tones as the wind does in the Eolian harp. It would be endless to pursue this effect under all the various shapes in which it appears to us. 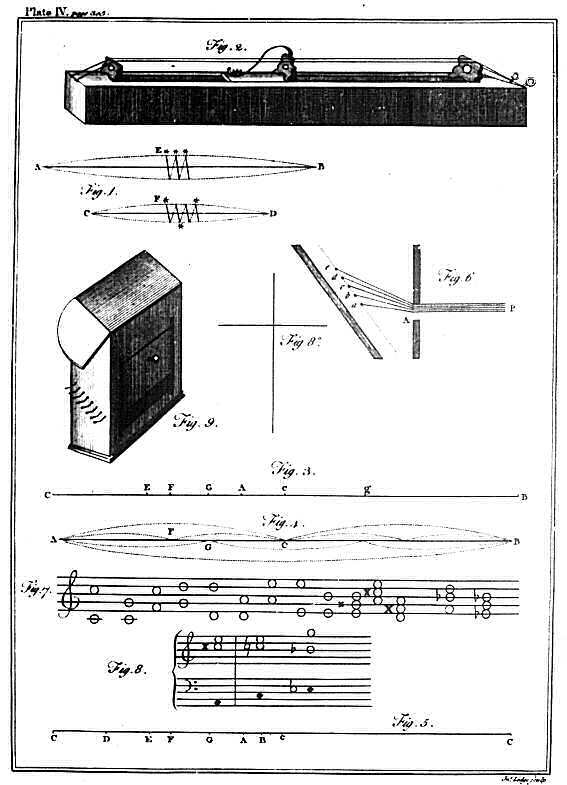 It is sufficient for our purpose, that we have many instances, in which air becomes musical by suffering a kind of refraction against the edge of some solid bodies: for this is the case with the Eolian harp: the wind passes to the strings of the instrument by the edge of an aperture; whence it is inflected, partly at a greater, partly at a lesser angle: and that portion of the current of air which makes a different angle with the plane in which the strings lie, excites a different tone. I have expressed my meaning in plate IV. fig.6. where A is the aperture, P a pencil of air, a, b, c, d, a section of the strings, receiving the impulse of the air at different angles. 1. it is more simple and natural because the two tetrachords which make up the octave are similar; that is, they both have the hemitone in the same place, as it happens in the two tetrachords of the major key. 2. It leads to a greater variety of modulation; and though the harmonies by some are accounted harsh, yet in my opinion they are more stately and pleasing than in the flat key with its two dissimilar tetrachords, as now managed by modern masters; who have entirely dropped the other form, though it has excellencies peculiar to itself, and therefore deserves to be retained. The analogy between sounds and colours is very strict and may be carried very far. In the order of the seven colours, three of them are simple and primary, the red, the yellow, an the blue: so in the seven degrees of the octave, there are three principal tones which constitute its harmony, the unison, the third and the fifth; and these have the same places in the series as the three simple colours have in the prismatic spectrum: red is in the place of the unison, yellow in the place of the third, and blue in the place of the fifth. All harmony, though the parts are never so many, is made up of these three sounds, as all hues are composed of those three colours. Upon the whole, the Eolian harp may be considered as an air-prism, for the physical separation of musical sounds. The form of it may be improved, so as to give a farther illustration to the principles I have adopted. Instead of fixing the strings to the outside, I dispose them upon a sounding board or belly within side a wooden case, and admit the wind to them through a horizontal aperture, so that the affinity of the instrument to an organ-pipe appears at first sight: and thus it becomes portable and useful any where in the open air, instead of being confined to the house; which is a great advantage. (note: I made an Eolian harp of this construction, and sent a model of it, upon a small scale, to Mess. Longman and Broderip in Cheapside, who have worked upon it under my direction, and will be prepared to dispose of them at a reasonable price to such gentlemen as take a pleasure in this agreeable class of experiments). No person of a musical ear can listen to the Eolian harp, without discovering, that the sound varies with the intensity of the wind. The unison with a sudden gust will change immediately into the octave on the same string; which happens in other instruments: the common and German flutes give the octaves with a more intense blast of the breath. What seemed to me most inexplicable of all, was this, that if the Eolian harp is exposed to the air with a single string, that string, without any change in its situation, will be hard to sound all the harmonic notes, which are seven or eight, beside the unison, and several of them will be heard at the same time. When many strings, which the wind meets at different angles, sound together, we have not only the harmonics of the unison variously produced, but harmonics of the harmonics, as above mentioned.